In Kansas, as in other states, the divorce process begins with a petition for divorce, your written request to the court asking for a divorce. 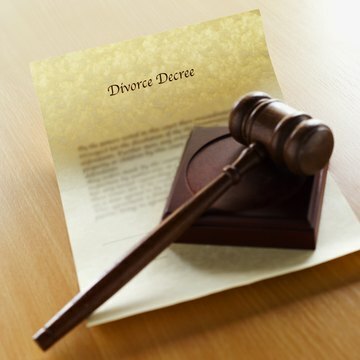 Typically, petitions include the grounds on which you are seeking a divorce. However, Kansas law permits couples to divorce on the no-fault ground of incompatibility, so you can list this as the reason for your divorce. Your petition must also include the specific relief you are requesting, such as your child custody arrangements and spousal support payments. Kansas courts require several other forms in addition to your petition, including a civil cover sheet, domestic relations affidavit, child support worksheet and parenting plan. These forms are available from the Kansas Judicial Council’s website. The civil cover sheet, or civil information sheet, lists basic information about your lawsuit such as your name and address, your spouse’s name and address and the names and Social Security numbers of your children. The domestic relations affidavit requires much of the same information along with additional financial information about your income and existing child support payments. If you have children, the child support worksheet and parenting plan detail your financial information so the court can calculate appropriate child support amounts and your custody plan. You must file your petition, filing fee, domestic relations affidavit and civil cover sheet with the district court clerk before your case can begin. Your petition and domestic relations affidavit must be notarized. When you file your petition and accompanying documents, the court clerk will give you a case number, and you must then notify your spouse that you filed divorce paperwork. If your spouse is willing to sign a voluntary entry of appearance form in front of a notary, this acknowledgment satisfies the notice requirements. If not, you must fill out a request for service form to ask the sheriff to deliver a copy of your petition and summons to your spouse and pay a sheriff’s service fee. If your spouse lives outside of Kansas, you must arrange to have him served by local authorities or a process server where he lives. You can also mail the summons and petition to your spouse by certified mail; you must give the court the green return-receipt card you receive from the postal service as proof that your spouse has been served notice. After you have properly filed your paperwork and served your spouse with copies, contact your court’s clerk to find out how to get a final hearing date and time for your divorce. This process varies between courts, but Kansas law requires you to wait at least 60 days after you file your petition before you can get your divorce. Local rules may also require you to attend parenting classes if you have children. You must bring along an original and three copies of your divorce decree to your divorce hearing. This document is available from the Kansas Judicial Council’s website, and it lists key information about your case such as your custody arrangements, property division and any other terms. This document governs the legal obligations of you and your ex-spouse after your divorce is final. After the judge signs them, the court clerk will file the original and your and your spouse keep the remaining copies.